The daily deals leader has had one of the worst post-IPO performances of the past year. Groupon went public last November at $20, and went on to shed roughly 80% of its value. Things didn't get any better for the dot-com disappointment last month. The stock took a hit -- and not even for anything that Groupon itself actually did. 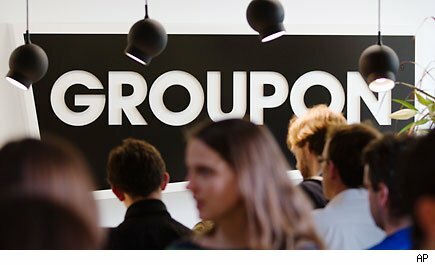 It was a lousy report by LivingSocial -- Groupon's rival -- showing slowing growth and an actual decline in sequential revenue. And LivingSocial isn't even public: Its quarterly financials are disclosed because Amazon.com (AMZN) is a significant investor. Groupon, too would have posted a sequential slip if it wasn't for its Groupon Goods addition. Well, this week Groupon will have its own moment to prove itself worth or validate the pessimism. Analysts see a small profit out of Groupon when it reports on Thursday. If there's any company that could use a break, it's Groupon. Financial journalists loved to point out how the stock itself had become a 50%-off deal when it slipped below $10. Now that the shares have been halved again, a 50%-off deal on a 50%-off deal is just painful. • Better news for investors will probably be there for the picking when Whole Foods Market (WFM) reports on Wednesday. The leading grocer of organic and natural foods has been on a roll lately. Whole Foods Market has come through with several quarters of strong store-level sales growth. An improving economy is finding more shoppers that traded down during the recession coming back to the upscale grocer. • Disney (DIS) turned heads with its $4.05 billion acquisition of Lucasfilm last week. Both companies got together for a press conference to explain the deal, but if there were any unanswered questions -- you know, stuff like if Princess Leia will be added to the Disney Princess line or if a new ride will be added to one of its parks ahead of the 2015 release of the seventh film in the Star Wars sage -- a good place for them to be asked would be when the family entertainment giant hosts its quarterly earnings call on Thursday. Motley Fool contributor Rick Munarriz does not own shares in any of the stocks in this article, except for Disney. The Motley Fool owns shares of Whole Foods Market. Motley Fool newsletter services have recommended buying shares of Walt Disney and Whole Foods Market.